CMS Administrator Seema Verma testified before senators Tuesday for the first time since her confirmation hearing, giving lawmakers a rare public opportunity to bring up policy issues that are key for their states. Here are five questions senators wanted answered, from the Trump administration's refusal to defend Obamacare to Medicare's role in opioid abuse. Earlier this summer, the Trump administration made waves with its refusal to defend the Affordable Care Act in a lawsuit filed by red states after the effective elimination of the individual mandate penalty. The Justice Department also asked the federal judge in Texas presiding over the case to overturn the law's consumer protections, including guaranteed issue for people with pre-existing conditions. Sen. Claire McCaskill (D-Mo.) pressed Verma for an action plan to protect the pre-existing conditions clause if the courts overturn the ACA. Verma agreed with McCaskill that congressional leadership should hold a vote on those protections. "I'm deeply concerned about people with pre-existing conditions," said Verma, who wouldn't comment on the pending litigation. "My job is to implement the law. If the law changes, I would work with Congress to make sure there is protection for pre-existing conditions." Sen. Maggie Hassan (D-N.H.) came up empty with her own questions about short-term plans, which she criticized as skimpy and ultimately harmful for people who might buy them and then get sick. While Verma acknowledged the plans aren't for everyone, she defended the administration's rule that extended renewability for up to three years. She said the Trump administration has strengthened consumer protections so people understand what they are signing up for. Sen. Doug Jones (D-Ala.) voiced his worries about his deeply conservative non-expansion state's proposal to add Medicaid work requirements. Verma has previously said she is concerned about work requirements in states that haven't expanded Medicaid because of the so-called subsidy cliff—since ACA tax credits can't be applied to people below 138% of poverty. "In the case of Alabama we have asked: What is the transition? Is there a pathway?" Verma told Jones. "We don't want a subsidy cliff, and we have asked for more information, and we will look at that as we consider their proposal." While she didn't signal how the CMS would come down on the Alabama waiver, she defended the concept of work requirements for the expansion population, emphasizing the CMS' guidance that requires states not to include kids, pregnant women or the disabled and medically frail in their proposals. She added that people could opt for job training, education or community service if jobs aren't available. "We know the old way hasn't worked when people have lived in poverty for so many years," she said. "It's about trying something different." Jones also raised the specter of the Medicare wage index for healthcare workers—Alabama has the lowest—and said he was disappointed the CMS didn't address it in the August inpatient prospective payment rule and asked what the administration could do without a legislative fix. "We are having rural hospitals closing left and right, and everywhere I go, the first thing they say is it's because we're just not getting the same amount of reimbursement," Jones said. Verma said the CMS will look at the methodology and noted the agency included a request for information from stakeholders in the rule. "I'm concerned when there are these disparities," Verma said. "When you're a hospital in a rural area they're still paying the same price for equipment." She said she hopes the Trump administration will be able to do something on the wage index. McCaskill probed Verma on what the CMS can do about Medicare's role in the opioid epidemic. She wanted to know why the administration didn't support negotiation for naloxone in Medicare Part D, where prices for opioid overdose reversal drugs are spiking in response to increased demand—especially when compared to what the VA health system pays for the same drug. 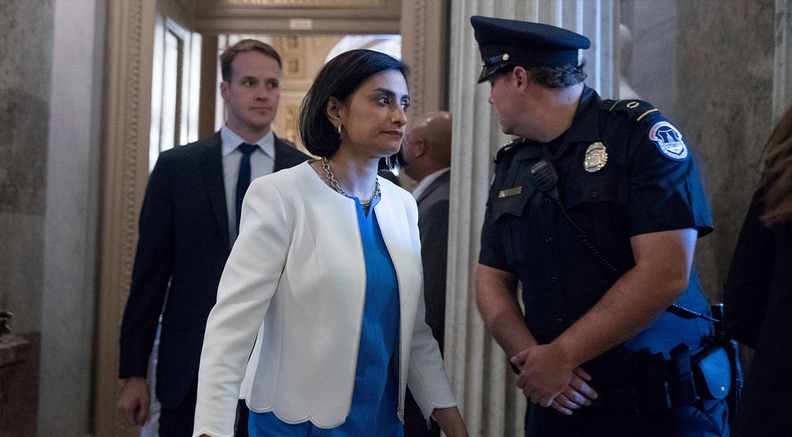 Verma defended the Trump administration's stance, saying she wanted to keep an open formulary for seniors in Medicare Part D. McCaskill was skeptical. "Maybe for opioid overdoses, for saving someone's life—it seems very weird to me that the VA can have this drug at a significantly lower price than Medicare Part D," McCaskill said. McCaskill also brought up opioid overprescribing within Medicare Part D, an issue flagged earlier this summer by the Government Accountability Office. The issue is personal to her: the senator watched her mother become addicted to opioids under Medicare Part D.
Verma told McCaskill her staff would follow up with progress on the CMS plan for the rulemaking required to follow the GAO recommendations. Sen. Maggie Hassan (D-N.H.) pressed Verma on what the CMS could do to penalize drug companies who misclassify drugs for the Medicaid drug program so they get paid more per drug. Verma said the CMS only had guidance authority, and Congress would need to give the agency authority to levy penalties on offending manufacturers; an example is Mylan's EpiPen, whose misclassification led to hundreds of millions of dollars in losses for the government. Verma said she would support congressional action to expand the CMS' authority.